The search continues for signs of the emerald ash borer in Wisconsin. The Department of Agriculture has been cutting down ash trees across the state since November, as part of efforts to locate the tree-killing insect. So far, there&apos;s been no evidence it&apos;s here. DATCP pest specialist Mick Skwarok says crews have already cut down nearly 400 ash trees across southern Wisconsin. The bark is peeled off and experts begin the meticulous process of examining the wood. Skwarok says it&apos;s a time consuming process that requires a close examination of the wood for EAB larvae that may be living inside. 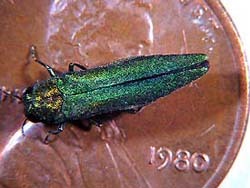 Emerald Ash borer has been found in Illinois and other neighboring states, increasing concerns it will show up in Wisconsin. Skwarok says by checking trees, they&apos;re hoping to get an early jump on the problem. Skwarok says they plan to cut down over 1,200 trees in 44 counties by this spring.